When The Fosters first started, we got a whole lot of Callie and Jude goodness as they navigated the strange, new Adams Foster world. It made sense that as their world grew, the less we saw them together. So, it’s nice that as The Fosters is coming to a close, we get to spend more time with the brother and sister duo again. The wonderful Callie and Jude scene on the front porch in “Giving Up the Ghost” is probably not the last of just them together, but if it were, it is a nice little closure-filled send off. And if anyone on this show deserves closure, it’s Callie and Jude. Callie has just received news that she was not accepted into UCSD’s art program. (Old person tip: When you get a small letter from the college you applied to, you did not get in.) So when Jude reconfirms that she’ll be driving them over to dinner with Donald and his girlfriend Natalie, she is not in the mood. But for Jude, she’ll muster up some energy to make it through an awkward meal. And awkward it is! 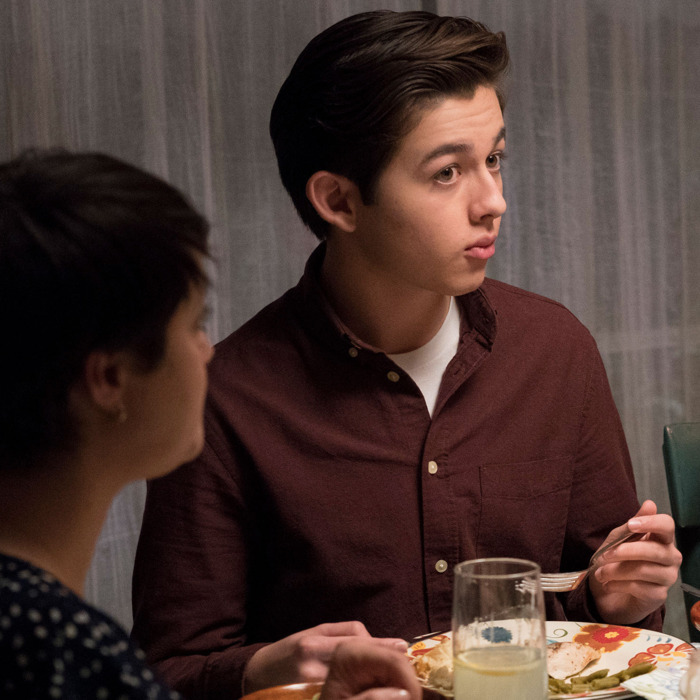 Natalie and her teenage son Caleb are very nice people, and along with Donald, the three of them seem to really be a family – but that’s kind of the problem. While Donald doesn’t know much about Callie and Jude, he is extremely involved in Caleb’s life, and that, understandably, hits Jude in the wrong way. As Jude spends time with Caleb, learning that Caleb, Natalie, and Donald recently vacationed in Hawaii together – er, at least vacationed in front of a green screen made to look like Hawaii – Donald and Callie get some one-on-one time. You guys, I didn’t know I needed a scene in which Callie and Donald talk about moving on from their past, but now that I have one, I can’t believe it took this long to arrive. It’s so lovely! The two get into Callie’s post-high school plans and she finally tells someone that she didn’t get into UCSD. Callie tells Donald that she feels okay about it – she never lets herself want anything too much anyway. She got into Portland State and that’s just fine. Donald doesn’t know Callie very well, but still none of this sits well with him. Callie let herself want a family and look what she got! (BTW guys, did anyone else tear up a little when Callie says “we’re happy” in regards to her family and she actually smiles? Be still my heart.) He, more than anyone, understands what it means to protect yourself from getting hurt, but he doesn’t want to see Callie miss out because she plays it safe. She returns the favor: Is Donald playing it safe with Natalie? He should move in with her. He doesn’t need to pay for what happened with Callie’s mom for the rest of his life. He is allowed to be happy, too. Yeah, The Fosters is really on some “final punch you in the gut with emotions” grand tour. Unfortunately, the special little moment is interrupted by news that Jude just fled from the house with no explanation. Callie finds him walking home and tells him that he’s being rude (and unsafe! ), but Jude is distraught. He thought Donald wasn’t able to be a father, but after seeing him with Caleb, it turns out he just isn’t able to be a father to Jude. Callie tries to calm him down by saying that he can always count on her, but Jude overheard Callie’s conversation about Portland State, so he’s having a hard time believing his sister right now. Jude walks home alone (!! ), but Callie is waiting for him on the front porch. Again, this moment is just so lovely. Jude can’t understand why Callie would move to Portland now. They only just found a home, a family. But that’s precisely why Callie can move away – because she knows Jude is safe and loved. And this is her home and her family, too. She’ll always come back. Plus, Callie and Jude are the dream team – distance doesn’t mess with that. I’m really going to miss these two. Thankfully, Jude has enough sense to apologize to Donald for running off. It seems that overnight, Jude has had a change of heart. He’s upfront about how he’s feeling regarding Donald’s relationship with Caleb, and when Donald replies that he isn’t trying to be Caleb’s dad, Jude stops him. Caleb deserves to have a dad who cares about him and Jude doesn’t want to be the reason that doesn’t happen. It’s more than okay with Jude if Donald goes all-in with Natalie and Caleb. Aww, Judicorn is all grown up, being insightful and doing the right thing! Callie, too, seems to take her time with Donald to heart, so she pays her UCSD art professor/mentor a visit. Callie wants to appeal her rejection. She wants to show them all that she really wants to be a part of this program – and she won’t hold back this time. Only, Callie’s professor tells her she wasn’t rejected because she didn’t want it enough, or wasn’t talented enough. It was because she had seen how much passion Callie had in helping Ximena and could tell that level of passion was missing from Callie’s art. Maybe art isn’t Callie’s calling. I don’t really think it’s up to this professor to tell Callie what she wants, but, like, we have a spin-off series to set up, so I get it. Speaking of future plans, Mariana is beginning to think about where she’ll end up after Anchor Beach. Mariana has a nicely typed up list of potential schools, but her college counselor gets real with her: Those schools are highly competitive and Mariana quitting STEAM activities won’t do her any favors. So when BFF Emma mentions she’s working on a robot for an application to a coveted STEAM-based internship, Mariana thinks she’s found the answer to her problems. When Emma discovers that Mariana is also applying for the internship – an internship that only takes 25 students from across the country – she isn’t pleased. They’ll never take two kids from the same school and Mariana wouldn’t even know about the internship if it hadn’t been for Emma. That, paired with the fact that her boyfriend is constantly M.I.A. because he’s off helping Poppy with roller derby stuff, is the final straw for dear Emma. The Adams Foster twins are really ticking her off. When Mariana, Emma, and Poppy all make the roller derby team, Emma decides to try out for one of the two jammer positions – the very same positions Mariana and Poppy have been working their butts off to win. Mariana tries to stop her, but if Mariana can go after Emma’s internship, Emma is totally fine going after Mariana’s roller derby position. Of course, it’s Poppy who loses out in the end, and Emma doesn’t feel very good about what she’s done. Both Mariana and Jesus are mad at her. Jesus is especially protective of Poppy – wait, are these two going to hook up? I am already cringing. Emma tries to give back Poppy’s spot, but Ximena won’t allow it. You earn your position on this team. You compete against yourself and you always push your teammates to be their best, even if their best is better than you. The sentiment motivates Emma to be the bigger person about applying for the internship. Of course Mariana can apply, too. Still, I worry about how Emma’s time on The Fosters is going to wrap up. Will she really lose both her best friend and her boyfriend? Say it ain’t so, show! • Here’s a great, weird sentence: Brandon performs a spiritual cleansing in Grace’s apartment to help his sick girlfriend rid herself of a pesky ghost she believes is tied to her cancer. What is Brandon’s life even? • Lena mama lions the hell out of the Tess situation and it is glorious. Logan overhears Stef and Lena arguing about his mom possibly being a lesbian. Tess marches over to confront Stef about outing her, but she meets Lena at the front door and Lena has had enough of it. She tells Tess to keep her drama on her side of the fence, they have enough of their own, thank you very much. • Stef is still spiraling. She finally begins to open up to Lena and most of it has to do with heaps and heaps of self-loathing. Here’s hoping there’s a big turn-around before the series finale. Lena and Stef will get their happy ending!